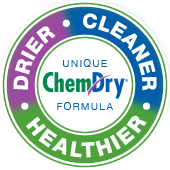 Chem-Dry of Wake County is one of the leading carpet cleaners in the Raleigh & Cary, NC area, and it’s easy to see why. Our unique Hot Carbonating Extraction (HCE) process delivers a deeper, longer-lasting carpet cleaning, all with much shorter drying time. Combine that with our green-certified solution that is safe for your kids and pets, and you get the most ideal carpet cleaning service in Raleigh & Cary. We take pride in providing cleaning services that really work at a price you can afford. Using the patented Chem-Dry® equipment and solutions means that we clean deeper, but more gently. We remove smells and stains from deep within your carpets, not just the surface, so you know your carpets are really clean. With our powerful yet natural cleaning solution, millions of tiny bubbles are employed to lift dirt and grime hiding deep in the fibers of your carpet. We leave your carpets clean and fresh without soaking them with water and harsh chemicals. How do we do this? Through the power of carbonation. Most other cleaning methods force water down into your carpet fibers and padding, and though suction is used to remove the water, a large amount remains. This creates a breeding ground for mold, mildew and other bacteria that can be harmful to your home and family. When you choose Chem-Dry of Wake County, your carpets dry in 1-2 hours, rather than the 1-2 days required by most carpet cleaning companies in Raleigh and Cary. Quicker drying means less time for mold and mildew to grow. Clean your carpets the right way – call Chem-Dry of Wake County at (919) 285-3140. We provide a drier, cleaner and healthier carpet cleaning in Raleigh, NC and the surrounding areas. We Clean For Your Health Like No One Else! Not only do we strive to create a carpet cleaning experience in Raleigh and Cary for you and your family that you can trust but one that will keep your carpet cleaner for longer so that you can focus on what matters most. Our certified carpet cleaning technicians will walk you through our process, answer any questions you have and even show you any areas of concern. From there we will work to lift dirt and grime to the surface of your carpet using our powerful, non-toxic solution and state-of-the-art equipment so that your carpet stays drier, cleaner, and healthier. The Chem-Dry cleaning process uses 80% less water than typical steam cleaning so when we clean carpets, they dry within hours, not days. This means you and your family can get back to your everyday routine sooner and not have to walk across soggy carpets. If you want to learn more about the benefits of our process, check out a full comparison of Chem-Dry vs steam cleaning. 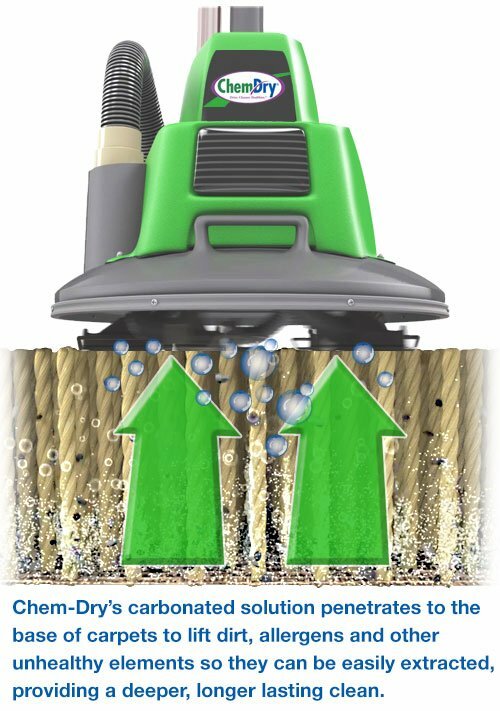 Our primary solution is unique because it uses microscopic carbonated bubbles to penetrate deep into your carpet’s fibers. 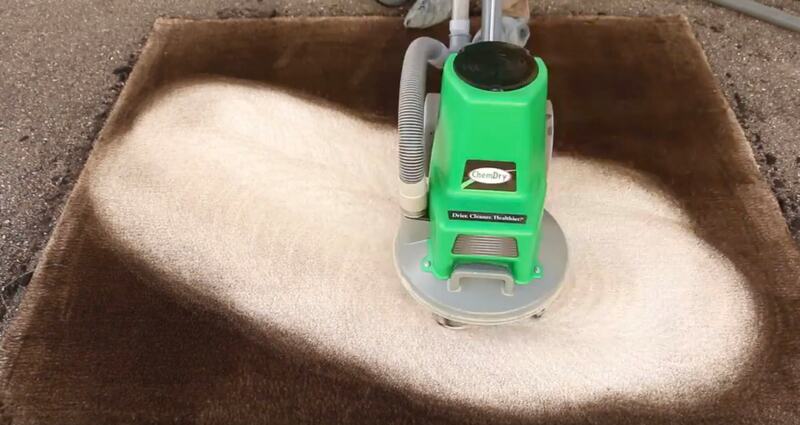 The carbonation lifts the dirt, stains, and other grime from deep within your carpets so it can be cleaned away completely away with our powerful extraction equipment. This unique approach to carpet cleaning gives you the most thorough clean, instead of just cleaning the surface of your carpets. Plus, there is no dirt-attracting soap residue left behind, so carpets stay cleaner longer. Because we use a low-water method, there is far less risk of mold and mildew growth under your carpet that often results from the excessive water used by steam cleaning machines. We use a natural, green-certified cleaning solution that does not contain any harsh soaps or chemicals and is completely safe and non-toxic for children and pets. If that’s not convincing enough, an independent air quality lab found that our HCE method removes 98% of common allergens in your carpets and upholstery, and when a sanitizer is added, 89% of bacteria is removed for your indoor air*. That adds up to a safer carpet cleaning that is healthier for you, your family and your Raleigh home.